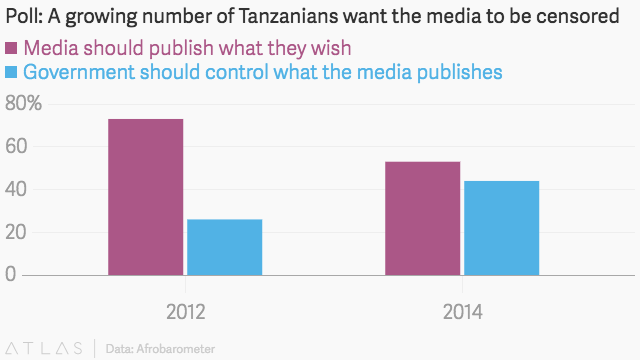 Tanzanian newspapers and journalists are treading a fine line. In June, a man was charged for allegedly using abusive language against the president on the social networking platform WhatsApp. This follows another case earlier in the month where an individual was convicted and sentenced to three years in jail for calling Magufuli an “idiot”on Facebook. Neither of those arrested was a journalist. However, in mid-July the managing editor of the daily newspaper Mwananchi and one of his reporters were questioned by the police, after the newspaper published a feature story about law enforcement. This turn of events has created a situation where journalists are reluctant to report on tough stories for fear that they may fall afoul of authorities. Meanwhile, editors play it safe out of concerns that their publications might get shut down. “I am limited in what I can report. I feel that I have a responsibility to report what would not upset the government,” said an editor at one of the nation’s largest newspapers, who requested anonymity so she could speak candidly. Tanzania has a history of banning outlets deemed to have overstepped the boundaries of acceptable public discourse. Even so, the country is ranked as having one of the better press freedom records in Africa, according to Freedom House. The climate worsened last year when then-President Jakaya Kikwete signed into law a cybercrime actwhich made it illegal to share content online that is deemed “false, deceptive, misleading or inaccurate.” Accompanying this law was another piece of legislation, the statistics bill, which was enacted at the same time. The Kikwete government defended the laws, saying they were instituted to protect the country against the erroneous use of data and the emergence of new threats from illegal online behavior. But critics say it has criminalized the use of data not sanctioned by the National Bureau of Statistics, and that the two laws together seem to focus more on policing speech than combating crime. Erick Kabendera, an investigative journalist with the regional publication The East African, said it is definitely the case that journalists are pulling their punches. Public opinion also appears to be on the journalists’ side. A poll by research network Afrobarometer, conducted before Kikwete’s anti-press laws were approved, found that the majority of respondents believed the government should not be able to censor journalists. Kabendera offered some tips on how journalists can move forward in this restrictive climate. “Exercise caution. You need to have checks and balances [in newsrooms],” he said. Fausta Musokwa, an analyst with an organization that funds investigative journalism, the Tanzania Media Foundation, said this is a time for journalists to report and educate the public and get them engaged about the effects of the laws. “Generally, our journalists are not critical and this [could be] another missed opportunity to aggressively cover the issue,” she said. “There is room to report on the law without it being a fight against government. This post originally appeared on IJNet and is republished on Quartz with permission. IJNet delivers the latest on global media innovation, news apps and tools, and is produced by the International Center for Journalists.